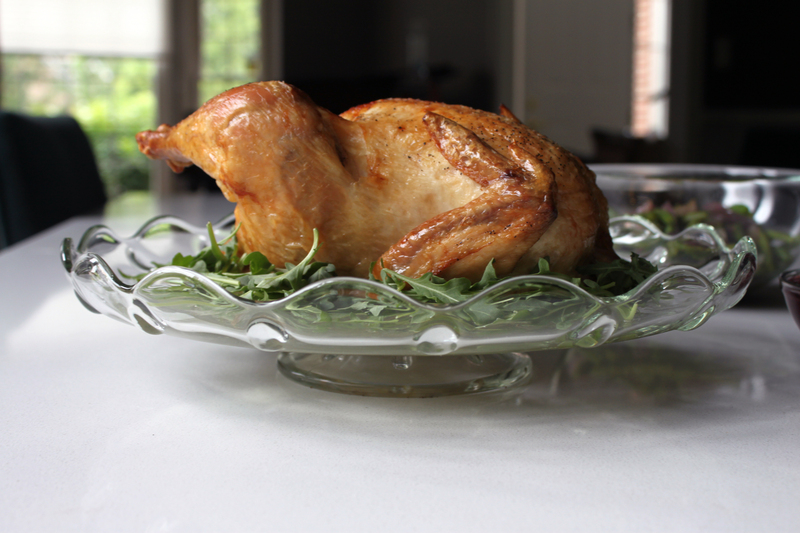 You are here: Home / The Kitchen / Convection Roast Whole Chicken; The BEST Tasting Chicken Ever! Whew…..We have been busy! My little one’s second birthday party was last weekend and we’ve been going ever since. He was such a little party animal – he partied too hard and then got sick! Nothing too serious, just a cold but I’m afraid to say that now, 3 days later I’ve developed it. Luckily, I knew this would happen so 2 days ago I convection roasted 2 whole organic chickens and made 3 batches of my homemade bone broth (I make it in the crock pot, directions here) so we’ve already been enjoying the homemade bone broth chicken noodle soup I made and have even more in the fridge. If you’re in the process of doing an elimination diet this is a great recipe for you too! Sometimes the best recipes are the simplest and this is one of them. 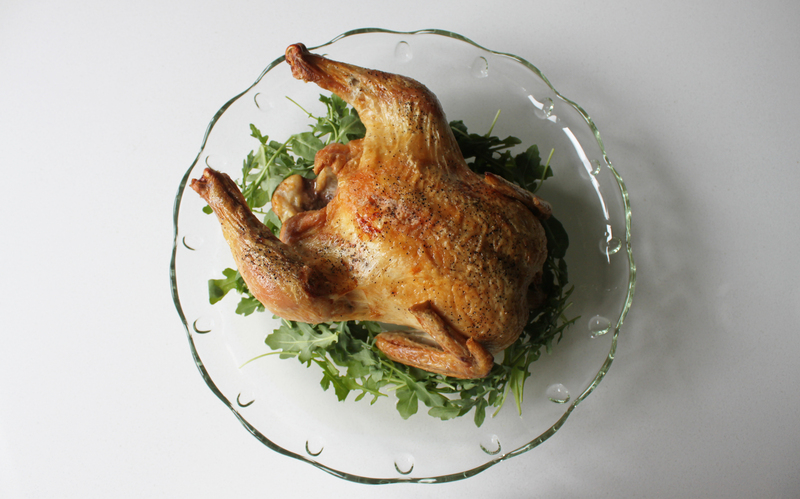 Good quality high smoke point oil (we use avocado), Celtic Sea Salt and fresh black pepper is all you need to make this ridicuously tasty roast chicken! Of course that means it’s gluten free, dairy free, soy free and nut free too! I had never roasted a whole chicken in the oven until a few years ago because I didn’t know how. It’s so easy that we now do this about once per week! My husband proclaims every time, ” I can’t believe how juicy this is!” and I love the crispy skin. We even change up some of the flavors – I’ll try and post my variations soon. Preheat your oven to 400 degrees on the “convection” setting (sometimes I do 2 chickens at a time in which case I set the oven to “Multi-rack Convectino”). Place your onions on the bottom of your glass baking dish. Top with your chicken, breast side up. Pat your chicken dry with a paper towel. Now, this may seem weird to you if you’ve cooked chickens before, but just leave the legs hanging open. Most of the time when people roast chickens they ties them together and while it may look a bit nicer, it’s not as good for convection cooking where we want the hot air to be able to circulate around the whole chicken. Drizzle with avocado oil (I usually rub it all over the bird with my hands), sprinkle with celtic salt and pepper. Put your chicken into the oven and bake at 400 for 20 minutes. Then turn down the oven to 350 degrees and bake for an additional 40 minutes or so. 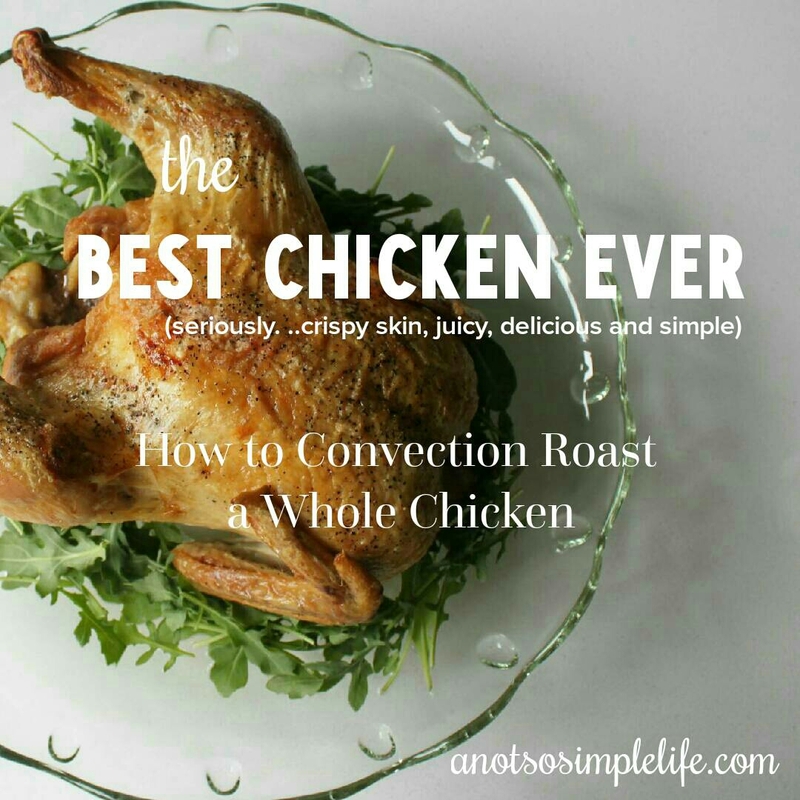 I would recommend using a meat thermometer to assure that your chicken is done, check out this post from Food & Wine. Also, the juices should be running clear. 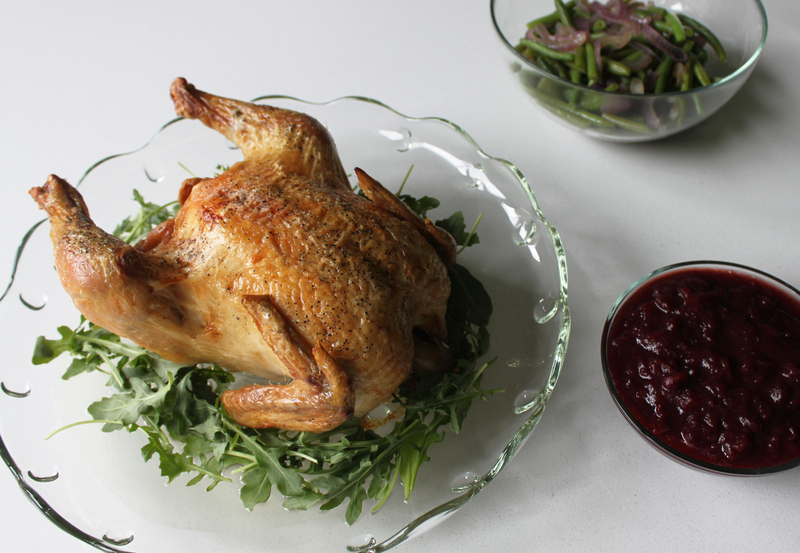 I LOVE eating this chicken with roast sweet potatoes and my maple cranberry sauce! Yum! Around this time of year (think Fall) we typically cook 2 chickens at a time and use the additional chicken to make homemade chicken noodle soup or “thanksgiving” salad. DON’T THROW AWAY THE BONES! Make homemade broth by following my directions here.